that you can’t live without? What makes photography a strange invention is that its primary raw materials are light and time. I know it’s not the Fourth of July but scrolling through some images this week got me thinking about some favorite things that I lug around with me on a daily basis in addition to my camera and an assortment of lenses. In my northern clime, fireworks displays and light parades do occur with some regularity on the mountain to celebrate winter and being prepared for these kinds of scenarios is a good thing! Some of these things may seem pretty obvious but they still bear mentioning…extra cards and extra (fully charged) batteries for your camera, flash, remote trigger, and flashlights. I do a lot of shooting in very cold temperatures and that does tend to use the batteries up more quickly. I couldn’t live without my tripod and the quick release plate is always attached to my camera. Sure you can hunt around and maybe find something to set your camera on to steady it but chances are it will not be found exactly where you need it to be in order to frame your shot. I love doing long exposures and night photography and for those, a tripod is indispensable! A sweet little item that resides permanently attached to my camera strap is an ML-L3 remote that triggers the shutter from the front, up to a distance of about 16 feet. I love this little tool and it has been used A LOT! In the lighting department I carry a speedlight flash and a ring flash which I use primarily for macro shots like the snowflake from last week. I have a Buglit LED micro whose nifty legs can attach to my tripod so that I can find my way back to it at night, a squeeze light in red in case I want to retain my night vision, and a Surefire E2 executive flashlight just in case the urge to light paint strikes! While on the topic of light, have you ever tried to look at your LCD screen in bright daylight only to find it next to impossible to see? A lovely little fix for that is the Hoodman loupe. Mine hangs on a lanyard and if I need to see detail on the LCD screen I simply place it against the screen and it blocks out the light showing me my image in far greater detail. It’s a little pricey but I do love it. 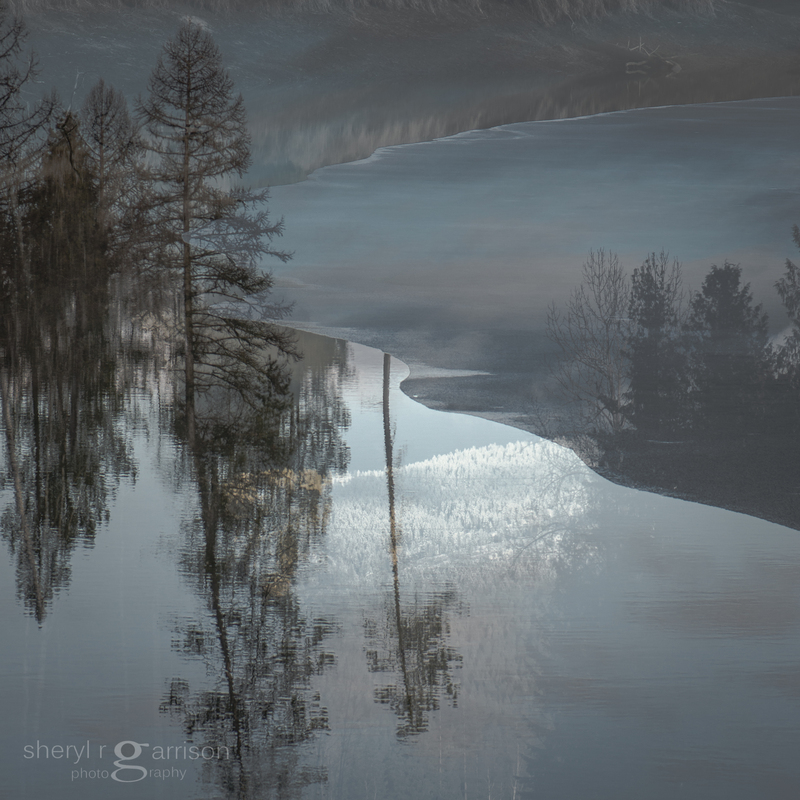 A few words about today’s image. 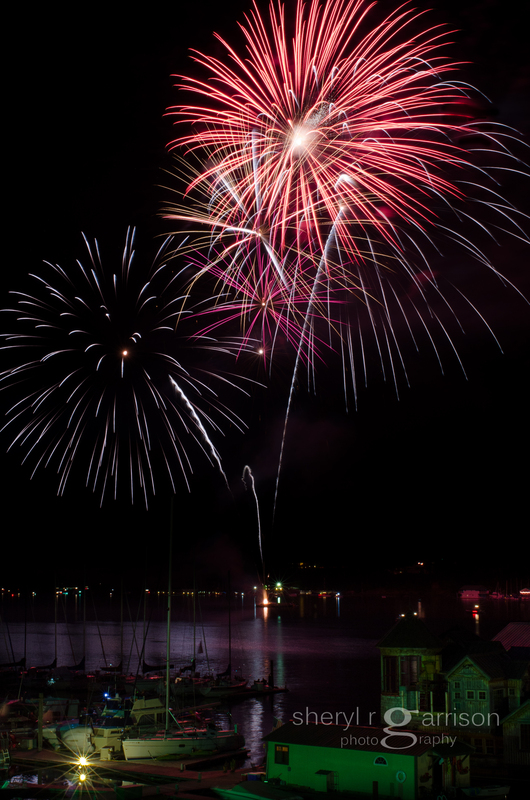 This fireworks shot was taken with my D7000 and a 35mm lens, the settings were f16, 22 sec, ISO 100 and because I shoot in RAW format I was able to lighten up the shadows in the foreground in Lightroom and expose the lights reflecting on the boats. This was not a composite shot… remember the piece of cardboard? I was able to capture multiple explosions by placing the black cardboard in front of my lens and selectively removing it as each firework was shot. I would love to hear what’s in your gear, especially those small odd items that can make all the difference in a shot. sometimes you have to focus on the little bits. Photography is a way of feeling, of touching, of loving. What you have caught on film is captured forever…it remembers little things, long after you have forgotten everything. I remember the exact moment that I became fascinated with macro photography. I use my camera every day and on this particular day I was at a loss for inspiration. My solution to this dilemma was to walk outside and pick a spot, sit down and look carefully at everything around me. It wasn’t long before I noticed a whole tiny world going on around me. My gaze was drawn to a bright green grasshopper on a dandelion stalk that had gone to seed. He was bright green, with the longest of antennae swivelling in all directions. At this time my lens of choice for every day was a pretty basic 55-2oo Nikkor which when zoomed out would have a nice soft background. I laid down on the grass, eye level with this small creature, only to discover that there was more going on upon this small stalk. Just above the grasshopper was the tiniest of worms…the intended dinner for the grasshopper. I captured the photo and it later became the focal point of an encaustic painting. In addition to that it sparked an avid curiosity for the tiny things that one might just walk by and never notice at all. As with most new ventures I didn’t want to run out and purchase a macro lens only to find it gathering dust somewhere down the road so I opted for a very inexpensive macro filter that could be screwed onto the end of a lens and enable you to get just a little bit closer in magnification. Naturally the glass was not extremely sharp and the edges were very soft but as an intro to macro it served me well. Today I shoot macro with a beautiful 105mm Nikon lens that allows me to capture things that I can barely see with my own eye. 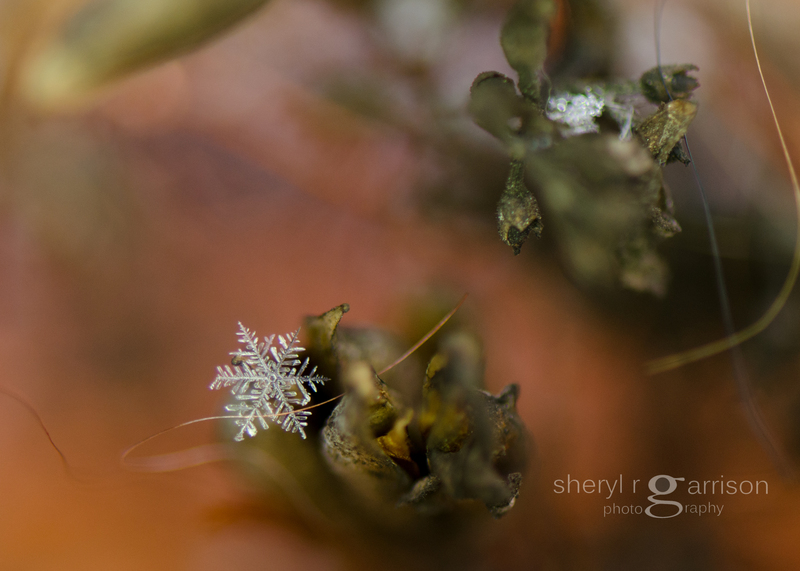 Using that lens has led me into a whole tiny world of beauty created by nature. Today I see the big picture but only because I’ve focused on the little bits. or why you should take these few extra steps before heading out for the day. There are some images that will be forever burned into my memory and at the top of that list is one particular bald eagle shot. I always tell people to carry their camera with them at all times because the one time that you don’t, will be the time that you will wish that you had. Of course this was back when I thought that just having my camera with me would be enough! The bald eagle in addition to being our national bird is the only eagle unique to North America. 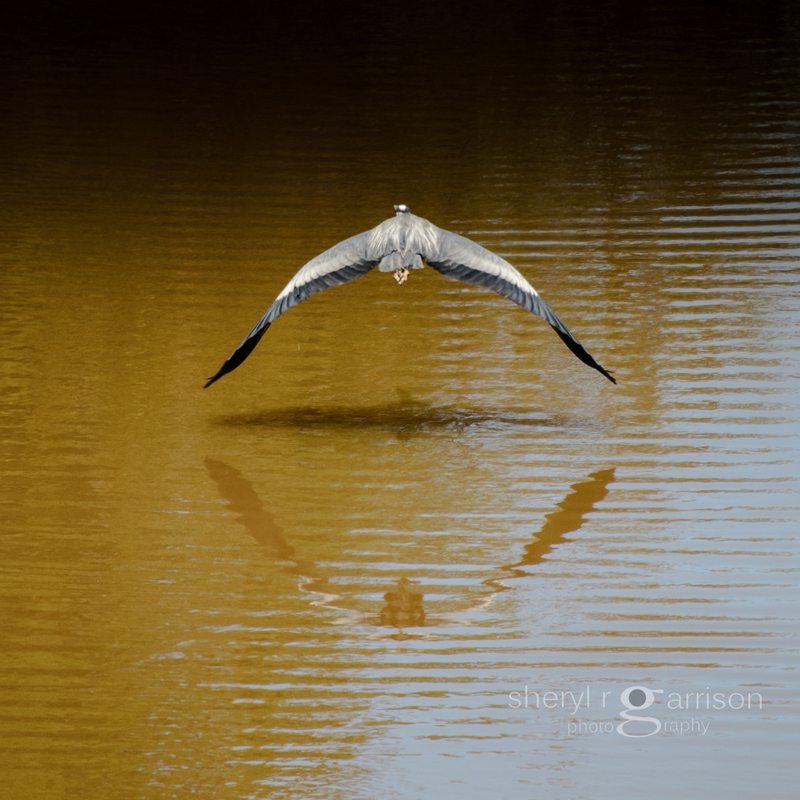 They weigh between 10 to 14 pounds and have a wing span of 6 to 7 feet which can only be fully appreciated when one is at eye level with one such bird…and that is exactly what happened one summer morning as I was driving down the road only moments from home in the Idaho countryside. At least one camera and an assortment of lenses are always with me in my daily travels and I truly do feel quite naked without them. They reside in a large ‘handbag’ of sorts that doesn’t scream ‘I’m a camera bag!’ The day after the best shot I never got, I started a new ritual so that maybe another time this image would be in a printable format instead of just indelibly lodged in my brain. My camera now sits on the seat beside me, the lens cap is off, and I have set it manually. I’ve taken a test shot and adjusted for light conditions. I’ve set it for a shooting speed that will capture action. Only then do I feel that I have done all that I can do to prepare for that once in a lifetime shot. On this morning though my camera was residing in its bag on the seat beside me and as I crested the hill I came eye to eye and within 20 feet of a bald eagle who had a roadkill deer carcass lifted about 3 feet off the ground. He was struggling mightily with the load and you could almost feel the power coming from the downward beat of his wings. Not taking my eyes off of him I reached my hand into my bag and began drawing out my camera and just like that he was gone. I’ll never know if it was the weight of the carcass or my presence that caused him to abort but I do know that if this had happened today, you’d be looking at the shot instead of hearing me tell you about it. We all have time to play with adjustments on the stationary landscape or scenery shots but these action packed moments are the ones that we need to be prepared for…those times when you get one shot, maybe even through the windshield, but you get one shot. If there is a next time, I’ll be ready will you? I have a vision of life, and I try to find equivalents for it in the form of photographs. I am often asked how I stay so creative and where do my ideas come from. The best answer I have would be that I make feeding my creativity a daily habit. I have always been one to have my camera with me at all times but in the past perhaps did not use it every single day. That all changed 600 days ago when a friend of mine suggested that I join blipfoto, a daily journal for photographers, where an image is posted each day and must have been taken on that day. I found the prospect of doing a 365 day project appealing and began posting an image of my world every day. This was not without its own set of challenges and some days, perhaps more so initially, it felt like one more task that I had to get done for the day. In time though it developed a rhythm of its own and I noticed some changes taking place in how I was photographing. With the advent of digital photography we were all of a sudden able to take hundreds of images and just discard the ones we didn’t like. Why not? There was no film involved and no cost for developing. I took it one more step backwards and with the purchase of my first DSLR realized that I wasn’t doing what I had always done with a film camera which was to shoot it in manual mode and make my own decisions on shutter speed, aperture etc. If you want to be more creative, take your camera off the auto setting and although it may be frustrating at first, you’ll soon wonder why you ever let the camera make decisions for you! Using my camera every day made me develop a relationship with it again and that in turn fueled the desire to be able to capture images that were more meaningful to me. The volume of photographs that I take has dropped drastically from those early days of digital. I edit those captures every day so I try to make each shot count and get it right, in camera, as often as possible. This lessens the work load too while in the digital darkroom!